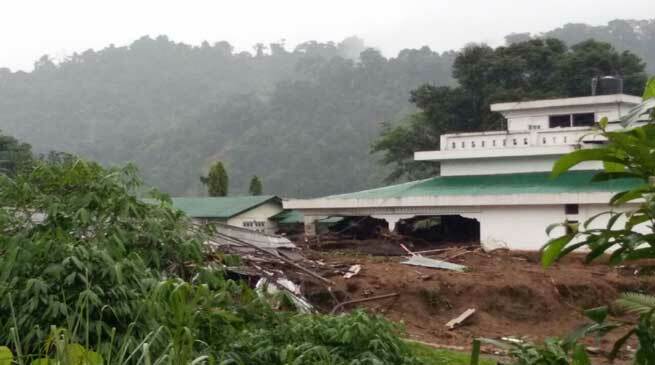 The torrential rain that triggered Massive landslides on a road near Tippi at Bhalukpong has caused substantial damage to the school buildings, circuit house and storehouses of PHE, PWD, WRD and RWD department, and has flooded the local police station. A small hillock near the Old Inspection Bungalow caved in due to heavy rains while several houses were buried under sludge. Five officials of Intelligence Bureau have also been reported missing after the landslides. It is reported that all department officials along with the local state police are currently engaged in the search and rescue operations along with the medical team and their supplies. Also personnel from Army, ITBP and BRTF with two JCBs are on the spot assisting the rescue mission. The Governor of Arunachal Pradesh Shri JP Rajkhowa has expressed shock and grieved the loss of lives in a massive landslide triggered by heavy rainfall at Bhalukpong in West Kameng District. Condoling the loss of lives and praying for the eternal peace of the departed souls, the Governor has announced an ex-gratia relief of Rs. 1 (One) lakh for the next of kin of each of victim died in the landslide. Chief Minister Kalikho Pul has expressed profound sorrow over the loss of lives in the Bhalukpong landslides in the West Kameng district triggered by torrential rains that claimed two lives and several others injured in the accident. Condoling the death, the Chief Minister prayed for the eternal peace to the departed soul and to give strength to the grieving family members to bare the irreparable loss. Also wishing for early recovery of those injured. The Chief Minister who is constantly monitoring the situation from New Delhi, has directed the West Kameng district administration to mobilize all heads of the department, officials & staffs, including Army, ITBP and local police for search and rescue operation, where reportedly 6-7 people are still trapped under the debris. To meet up financial needs for carrying out relief and restoration works, the Chief Minister has directed the district administration to use the fund of Rs 30 lakhs at their disposal. Also he informed that an additional fund of Rs 1 crore will be placed under Deputy Commissioner, Bomdila for carrying out the relief and restoration activities. Meanwhile three people have been rescued who have sustained serious injury. According to the reports received, the names of the injured are Deb Bahadur, Santosh Thapa, Pankaj Chetry and Mohon Burman. The Chief Minister has directed all the concerned authorities to ensure timely relief activities, including provision of proper medical care, food and shelter for the affected. Pul said he would personally visit the accident site and make spot assessment. He announced ex-gratia relief of Rs 4 lakhs for the deceased late Dil Bahadur Chetry, 50 and late Dilip Gwala, 15. Also for those injured, the CM announced Rs 1 lakh as immediate recourse. Further, based on the nature of injury and their treatment, the Chief Minister assured that the state government would bear all the medical expenses. Also he assured that welfare of the next of kith and kin of the deceased and those injured would be taken cared with the promise to pay a visit to them.